Background To maximize resources, the antimicrobial stewardship program at a pediatric tertiary care hospital made pediatric dosing specific guidance within the electronic health record available to all hospitals within the health system. Objective The objective of this study was to compare the appropriateness of antibiotic dosing before and after the implementation of an electronic intravenous (IV) antibiotic order set. Methods This was a retrospective cohort study evaluating orders from patients younger than 18 years who received cefepime, piperacillin–tazobactam, tobramycin, or gentamicin at 12 health-system hospitals. 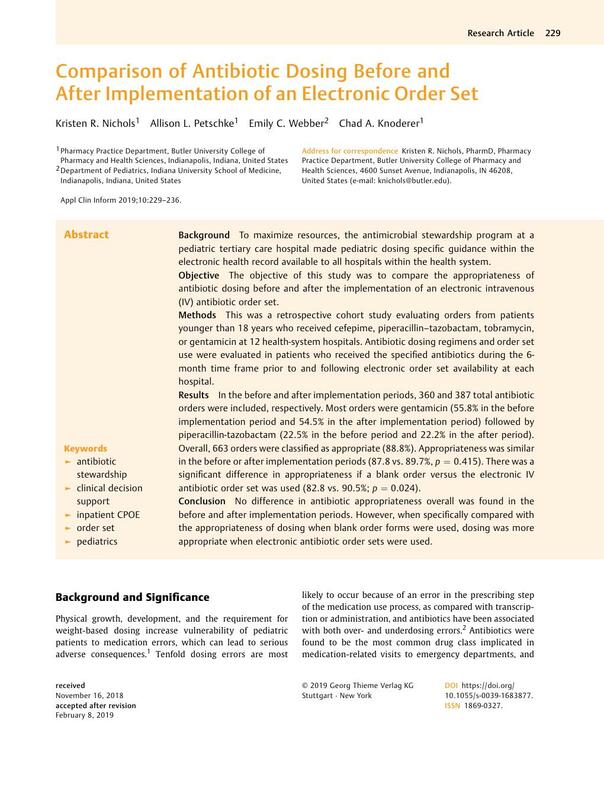 Antibiotic dosing regimens and order set use were evaluated in patients who received the specified antibiotics during the 6-month time frame prior to and following electronic order set availability at each hospital. Results In the before and after implementation periods, 360 and 387 total antibiotic orders were included, respectively. Most orders were gentamicin (55.8% in the before implementation period and 54.5% in the after implementation period) followed by piperacillin-tazobactam (22.5% in the before period and 22.2% in the after period). Overall, 663 orders were classified as appropriate (88.8%). Appropriateness was similar in the before or after implementation periods (87.8 vs. 89.7%, p = 0.415). There was a significant difference in appropriateness if a blank order versus the electronic IV antibiotic order set was used (82.8 vs. 90.5%; p = 0.024). Conclusion No difference in antibiotic appropriateness overall was found in the before and after implementation periods. However, when specifically compared with the appropriateness of dosing when blank order forms were used, dosing was more appropriate when electronic antibiotic order sets were used. This study was performed in compliance with the World Medical Association Declaration of Helsinki on Ethical Principles for Medical Research Involving Human Subjects and was approved by Indiana University Institutional Review Board.